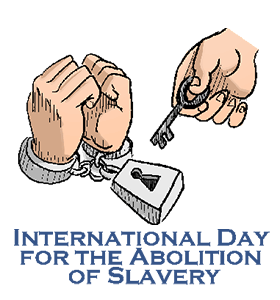 ﻿International Day for the Abolition of Slavery: Calendar, History, Tweets, Facts, Quotes & Activities. The International Day for the Abolition of Slavery aims to end slavery in the world. Contemporary forms of slavery include sexual exploitation, forced marriage, trafficking of persons and recruitment of children for armed conflict. The International Labour Organization estimates that there are currently 21 million people enslaved in the world, a business that generates around 150 billion US dollars in illegal profits every year. The International Day for the Abolition of Slavery was designated by the United Nations General Assembly as a day to be celebrated every December 2nd. The day marks the 1949 adoption of the UN Convention for the Suppression of the Traffic in Persons and of the Exploitation of the Prostitution of Others. The average cost of a slave globally is $90. Human trafficking is the third largest international crime industry after illegal drugs and arms trafficking. It generates a profit of approximately 32 billion every year. In November of 2016, a new legally binding protocol designed to strengthen global efforts to eliminate forced labor comes into effect. 1 million children are enslaved worldwide. Child slavery is a crime against humanity. Humanity itself is at stake here. A lot of work still remains, but I will see the end of child labor in my lifetime. – Kailash Satyarthi, Indian children’s rights advocate and founder of Bachpan Bachao Andolan. Donate to a charity fighting to end slavery. Antislavery.org works at local, national and international levels to eliminate all forms of slavery around the world. All proceeds from donations are put toward achieving that goal. Spread awareness by using the hashtags #InternationalDayforAbolitionofSlavery, #EndSlavery and #HumanRightsMatter. Volunteer your time at a local rescue center for victims of human trafficking. These centers assist victims in sharing their stories, regaining their lives and dignity and helping to reduce this problem. Read a book about the horrors of slavery. Some suggestions are: Uncle Tom’s Cabin , Beloved and Chains .